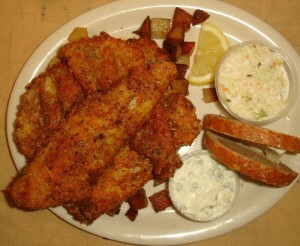 "Ask any Wisconsinite what is on the menu on Friday night and the answer is most likely going to be some kind of fish. Growing up in a smaller sized Midwestern town in Wisconsin, I became accustomed to Friday night eateries and the battered delicacies which were served in small wicker baskets. Perch, cod, or whitefish, beer battered with a side order of American fries and cold slaw and homemade tartar sauce was the main draw on Friday nights. Taverns and Legion halls alike served the traditional Friday night fish fry but why did the tradition exist and where is it today?The answer to the question is really two fold. Wisconsin has a strong representation of German Catholics who observe Lent. Lent is the tradition of abstaining from meat on Fridays during a forty day period preceding Easter. It eventually turned into a social event during prohibition years. Taverns needed a way to attract people to their businesses and often gave free fish dinners or lunches on Friday. Back in the day, fish was easily obtained and was very inexpensive for taverns so it made for a good calling card. The Germans came to the country with the technology of frying foods and it was an easy way to rapidly prepare a lot of fish, thus the social "fish fry" was born. They often had beer and liquor as an "under the table" service and as the years past so did prohibition but the traditions of serving fish has lasted through the years. 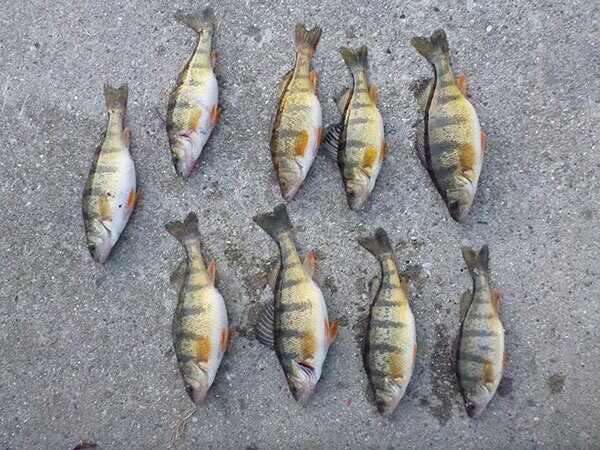 Today, taverns and eateries offer the fish fry on Wednesdays and Fridays regardless of religious orientation.Being on the water countless hours in the summer allows me to have fresh fish on a fairly consistent basis. For me, gone are the days of tromping out to the restaurants only to find long lines and hours of waiting. I enjoy my fish fries right at home. I have a set up in my garage which is equipped with a stainless steel table and a Stainless Steel Profry by Presto. It?s a great little unit that breaks down nicely and makes for easy clean up.So what makes a good fish fry? Good oil. Fish is one of those foods that you can prepare many ways and frying is one way to serve many people at once. The oil you fry your fish in is one of the most important parts of the fish fry. There is nothing worse than a soggy piece of walleye or perch. My favorite oil for cooking is Shore Lunch Miracle Frying Oil. It is a blend of vegetable oil, peanut oil and sunflower oil and is all natural. I like the oil because it withstands multiple fish fries. Many cheaper oils seem to break down after one use and never give that golden brown look to your filet. I might spend a little more money up front on the Shore lunch oil but I get multiple fish fries out of one batch of oil.The batter people use in all Wisconsin fish fries is the most fabulous part of this great tradition. Every single person that fries fish brings their own twist to the make-up of the batter. Somewhat mystical, many people use closely coveted batter recipes that might have been passed down from generation to generation or from old time guides to fishermen. I hold close the adage, ?less is more" when I fry fish. My preference is a lightly battered filet in an egg wash. Again, my favorite product is Shore Lunch as they have an array of choices depending on what I'm feeling. The sky is the limit when it comes to batters and the internet is a great source of information to find many more recipes. I would be remiss if I didn't say a little something about our tartar sauce. There are many good choices on the store shelf but my all-time favorite is homemade. I combine a little Miracle Whip salad dressing and sweet pickle relish and it is the finest dipping sauce made.Midwestern life is all about friends and family and sharing this simple meal is a great way to pass the time on any night of the week. Add a beer from your favorite local brewery and some American fries and you too can take part in this long standing Wisconsin tradition!"